Have a happy Hanukkah! Here's an FAQ from Jill about Hanukkah traditions. Jews begin celebrating on the first night of Hanukkah: after sunset on December 21, 2008. The first day of Hanukkah is December 22. The eight-day Festival of Lights ends on December 29, 2008. Why does the first night of Hanukkah change each year? Chanukah always begins on the twenty-fifth of the month of Kislev, as Jon Stewart tells Stephen Colbert below. The Jewish calendar is lunar, and its dates vary each year relative to other calendars, such as the Gregorian calendar used in the U.S. In fact, the first day of Chanukah can fall anywhere between November 28 and December 26. Hanukkah celebrates religious freedom and the rededication of the Temple (Hanukkah means rededication). Around 165 BCE, two groups of Jews -- one led by Judah Maccabee -- successfully revolted against the oppressive King Antiochus IV, who had prohibited the practice of Judaism, desecrated the Temple in Jerusalem, and ordered the killing of Jews. Once free, the Jews were able to rededicate the Temple. They needed oil for the Temple's menorah, which was supposed to burn every night, but according to the Talmud, the Jews had only enough oil to burn for one night. Miraculously, the oil burned for eight days, giving them enough time to obtain more oil. To celebrate this miracle the next year, the Jews began to observe an eight-day festival. 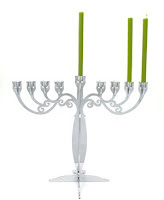 On each of the eight nights of Chanukah, Jews light a candelabra called a menorah after sunset. The menorah holds nine Hanukkah candles (or wicks in oil). On the first night, Jews light the shamash (attendant or "helper" candle), then light another candle with the shamash. On the second night, we light two candles plus the shamash. This continues until the eighth night, when we light eight candles plus the shamash. The custom of lighting Hanukkah candles has given the holiday its nickname, the Festival of Lights. In what direction do I light menorah candles? Candles are added from right to left, but they are lit from left to right. On the first night of Hanukkah, place one candle in the far right holder of the menorah, and light it with the shamash. (The lit shamash is often placed in the center of the menorah.) On the second night, put two candles in the two far-right candle holders, then light the left-most candle first. Is there a special blessing I can recite while I light the Hanukkah candles? Yes, while holding the shamash you may recite the Blessing over Candles and the Blessing for Hanukkah. On the first night, it's customary to recite the Shehecheyanu as well; this prayer celebrates special occasions and milestones. Where can I get a menorah? ModernTribe has unique artisan-made menorahs from girly to manly, glass to chrome, plus a kid's play menorah. 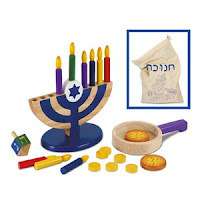 Menorahs are also available at synagogue Judaica shops and Jewish bookstores. What are some other Hanukkah traditions? A Jewish holiday wouldn't be complete without special foods! On Hanukkah we often eat foods fried in oil, such as latkes (pancakes made of shredded potato) and doughnuts (sufganiyot), to commemorate the Hanukkah miracle. Dairy foods also are commonly eaten. Families often exchange Hanukkah gifts or just give gifts to children. It's traditional to give children gifts of money, or gelt. Another Jewish custom is to give more money to charity each day of Hanukkah. 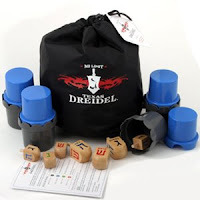 Another Hanukkah tradition is to play dreidel games—including No Limit Texas Dreidel. Singing Hanukkah songs is also a fun family activity. Jews often send each other Hanukkah cards. I've seen "Hanukkah" spelled many different ways. What's the correct spelling? Because it's transliterated from Hebrew, there are several possible spellings: Hanukkah, Chanukah, Hanukah, Chanukkah, Hanuka, and Chanuka. Less typical spellings include Hanaka, Channuka, Channukah, Hannuka, Hannukah, Kanukkah, Khannuka, Khannukah, Khanuka, Khanukah, and Khanukkah! To read more about the Festival of Lights, visit Chabad's Chanukah guide or Judaism 101's Chanukkah page.